TobyGadd wrote: After getting this set up and running, I am disappointed to report that it doesn't display individual battery status or capacity on my newer 2016 iMiev. EVBatMon and CanIon have the same problem. Seems that nobody can figure out how to do this with newer models. Maybe it's just not possible? That's odd. Just yesterday I connected Canion to a 2017 C-zero. Showed battery status and capacity just fine. Is that a problem only on newer US models? rnlcarlov wrote: That's odd. Just yesterday I connected Canion to a 2017 C-zero. Showed battery status and capacity just fine. Is that a problem only on newer US models? Does it show individual cell voltage and amp-hours? shows each block of 12 separately. indicates the capacity of the battery. the rest of the battery. all questions can be written on the hobdrive forum, you can add your new car. in hobdrive there are many settings, you can create everything as you want. 1 message added photo settings for the iMiEV electric car. also Minicab MiEV and C-Zéro, iOn. Serhge wrote: shows each block of 12 separately. 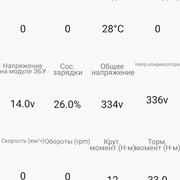 No, it does not show cell voltage on my 2016 imiev. enable log: system settings / debug logs / trace. Start the program, open the information screens, close the program. OBDZero try it, but it works just as badly. hobdrive opens new possibilities. all calculations are still verified. will be updated soon. hobdrive. does everything for the first time. hobdrive. already knows how to reset errors. hobdrive. add interior heater, air conditioning. the full version knows more than the demo. Hi Serhge, this all looks great. Is it possible with this program to reset airbag faults (SRS Light) after removing and replacing the airbag during vehicle work? also is there any access to the ECU / MCU adjustments? for speed limiter increase or any other "modifications"??? ?